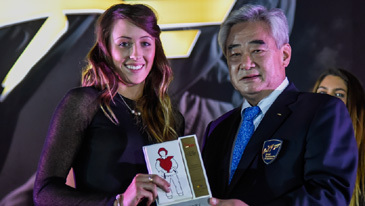 WTF President Chungwon Choue (right) poses with Great Britain's Jade Jones (left), who was selected as the "2014 WTF Female Player of the Year" during the 1st WTF Gala Awards Dinner at the Convention Center in Queretaro, Mexico on Dec. 5, 2014. QUERETARO, Mexico (Dec. 5, 2014) - At an inaugural gala awards dinner held in a convention center perched on a mountain overlooking this scenic, central Mexican city, the World Taekwondo Federation named Dae-hoon Lee of Korea and Jade Jones of Great Britain its athletes of the year. The "2014 WTF National Association of the Year" award went to the event’s host, Mexico. Choue added that this was “only the beginning and next year the event would be bigger and more formal at 2015’s Grand Prix Final in Mexico City."